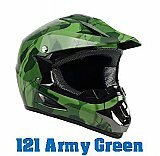 Extreme Motor Sales carries a wide range of men, women and children atv and dirt bike helmets. Off-Road helmets from GMAX, FLY Racing, ZOX, Vega, Bell and more! Stop in to Extreme Motor Sales, 2327 E Semoran Blvd, Apopka, FL and see our wide range of motocross helmets!